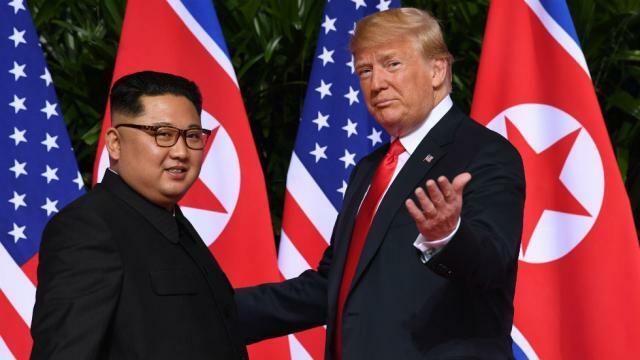 A new poll says that the historic Trump-Kim Summit in Singapore has made President Donald Trump more popular. The survey conducted by Monmouth University said a clear majority supported the summit held this week. Seventy-one percent of voters approved of the unprecedented meeting of the two leaders earlier this week in Singapore, which produced a joint statement vowing a “complete denuclearization of the Korean peninsula” and lasting peace in the region. Trump’s disapproval rating also dipped in the same survey following the historic meeting. Trump earlier expressed satisfaction on the outcome of the summit which he said enabled the U.S. to take “a big step back from potential nuclear catastrophe. 46 percent of the public has confidence that the President emerged from the day-long diplomatic affair looking stronger on the world stage as compared to Kim Jong-un. Voters are still split as far as their confidence in Trump’s ability to disarm North Korea is concerned. Thirty-seven percent believe Trump can deal with the reclusive dictator, while 36 percent has some reservations on his would-be handling of the situation. The respondents are also as divided about the Trump’s administration’s decision to suspend joint military exercises with South Korea, with those approving the decision a little higher at 46 percent compared to the 42 percent who oppose the move. The poll was conducted in the 48 hours following the historic summit and had 806 U.S. adult respondents. The results contain a margin of error plus or minus 3.5 percentage points.